Russian Rocket Poised For Crucial Supply Run To Space Station : The Two-Way After a string of launch failures, NASA says astronauts have just four months of supplies left. A Russian rocket launching early Friday could provide relief. On Friday, a Russian Soyuz rocket will send an unmanned cargo ship with more than 3 tons of food, water and fuel for astronauts aboard the International Space Station. The stakes are high for a routine cargo mission to the International Space Station, after a string of failures has left the orbiting outpost running somewhat low on supplies. 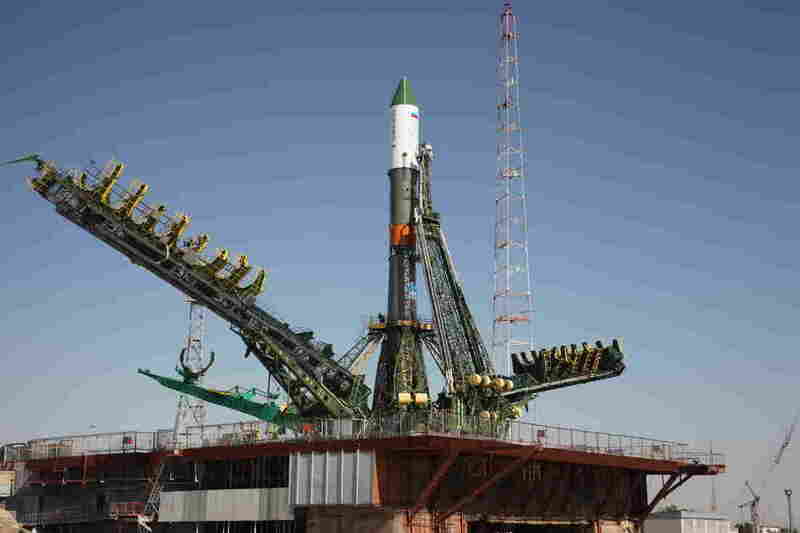 Early Friday, an unmanned Russian rocket will lift off with food, fuel and other essentials. The launch comes less than a week after another unmanned rocket from commercial firm SpaceX disintegrated shortly after liftoff. 'Don't throw anything away. Let's be a little smarter about this, so we can help the situation out' — that's kind of how astronauts and cosmonauts think. That was the third failure since October. Normally, the station is stocked with six months of supplies. "Today we're at, give or take, about four months," station manager Mike Suffredini said during a recent NASA press conference. The situation is still far from a crisis. Astronauts could survive until at least the end of October, and they have a spacecraft docked to the station that could take them home, should they need to leave. But observers say that any further failures could strain the station's "consumables," the essentials it needs to support life. Three astronauts are currently aboard the station, and three more are set to be added at the end of July. If Friday's launch fails, NASA could delay its plans to put all six crew members aboard, according to Clayton Anderson, a former astronaut who has done a tour on the station. "If this one doesn't go, I would wait," he says. A an unmanned rocket built by Orbital Sciences went up in smoke last October. Food, water and oxygen are on the short list of things the astronauts need to survive. Oxygen is not an immediate worry. The station has plenty of air and can generate more by breaking down water through electrolysis. But food and water are trickier. Normally water is carefully conserved by a sophisticated system that lets astronauts recycle things like urine. But the system depends on filters, and those filters are nearly full. Two sets of replacements were lost when the American rockets blew up. And NASA has run out of spares for now. So the astronauts will soon be depending on their water reserves. Food is that last essential. Right now the supply looks good, but Anderson says the crew may already be thinking about conserving what it has. In April, a Russian Progress resupply mission tumbled out of control after launch. It never reached the station.
" 'Don't throw anything away. Let's be a little smarter about this, so we can help the situation out' — that's kind of how astronauts and cosmonauts think," Anderson says. The loss of the supply rockets has the potential to create other problems, adds Wayne Hale, a former space shuttle manager who was in charge of the first supply mission to the station. One of the biggest might be trash. Twenty years ago, the Russians tried flushing the trash out of the Mir space station. It didn't work: "You had to worry about the trash bags coming back and smacking into your station or somebody else's satellite," Hale says. So, today astronauts use the cargo capsules that deliver their food and water as trash cans. The one they have right now arrived in February. It might be starting to fill up, Hale says, and that might not be so good for the station. "You begin to look like one of those houses that a hoarder lives in after a period of time, if you can't get rid of the trash," he says. This will not be the only opportunity to resupply the station. A Japanese mission is set to fly in August, and a private launch from the American firm Orbital is scheduled for sometime late in the year.